Since the get go I have been on the Hawkman band wangon. The book has consistently had a solid story and awesome artwork. This issue still has those elements. Our storytellers take us back to London with Carter Hall. The Deathbringers have descended upon Earth. These things are massive and resemble the Celestials of the Marvel Universe. Except hundreds of Hawkmen are inside. I felt a little betrayed by the appearance of an older character. I suppose I was hoping for a more of a solid win for Hawkman. What happens is a bit of cliffhanger that simply delays the on coming all out battle. 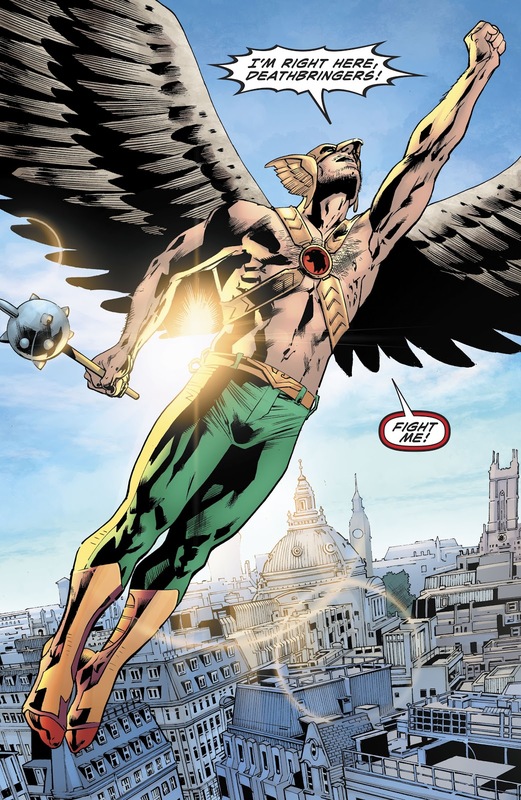 It could be that Hawkman could be revealed as something bigger. Issue #9 works like a bridge to develop the story. The issue does have a guest appearance of Madam Xanadu.